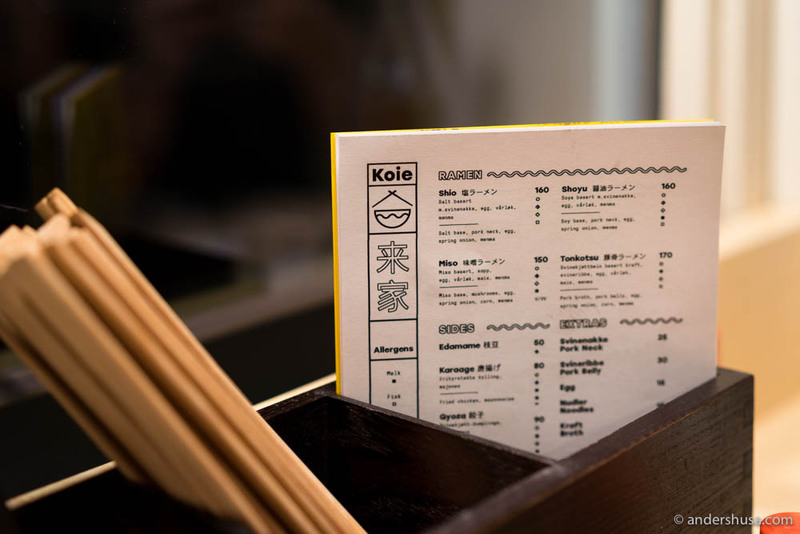 Koie Ramen opened in late September as Oslo’s first proper ramen shop. While we have been busy traveling from August till October this year, Oslo has exploded with new restaurants. If you keep an eye on my restaurant rumors, you know what I’m talking about. There are at least ten new spots I want to try out – but have no fear, I’m working my way through them one by one. Koie Ramen was high up on my priority list. I love the Japanese noodle soup. It’s one of the things I can really get a craving for. Also, Koie Ramen is the kind of place you can drop by pretty much at any time. In fact, they don’t even accept bookings – only walk-ins. Technically, Koie Ramen isn’t the first ramen shop in Oslo. As I mentioned in my recent article on the ramen wave that is about to his Oslo, Sapporo Ramen at Mathallen has already been running for more than a year. I wasn’t particularly satisfied with my meal there, though. Neither with the taste of the broth nor with the texture of the noodles (but I promise I will return soon and give them another chance). I can’t help but dislike the atmosphere as well, sitting in front of an industrial facade, located within a mini-mall. Koie Ramen, on the other hand, is situated at street level on Osterhaus gate 13 (cross street of Torggata), with an all-wood interior, and feels much more like a proper Japanese ramen shop. However, the main reason why I think it’s Oslo’s first real ramen restaurant is that they make their own noodles. That makes it all the more authentic. People feel very strongly about ramen. Obviously, the broth and the noodles, but also the meat, and even the egg – all have to be just right. There’s only one thing that is for sure: people will both love and hate Koie Ramen. Personally, I liked it, and I find that the team has done some major improvements since their pop-up-days at Teaterkjeller’n when it was still called Tanpopo Oslo Ramen. I’m not saying it’s perfect now, but the people working here are dedicated and passionate about what they do and they cook everything from scratch. While that is important, it also has to taste good. Luckily, Koie Ramen delivers on that point as well. I checked out Koie Ramen on a busy Friday night, together with Hedda and her sister Sara. It was one hour before closing time, and we ordered most items on the menu. That included three different ramen soups to share (Tonkotsu, Shoyu, and Miso), the Karaage chicken, and one plate of the gyoza. Paired with a large Kirin beer each (50cl), the bill came at NOK 1000 including tips. That’s NOK 333 per person, which isn’t super cheap, but definitely as expected in Norway. My first instinct when we entered was to order in the bar. It turned out, though, they actually do table-service, but menus, chopsticks, sauces, and seasonings were already in place. You just grab a seat along the window or at one of the large tables, and a waiter will come to take your order. Gyozas are steamed dumplings that are pan-fried on one side. The pork gyozas we had at Koie were juicy inside, with a good flavor from the meat, a delicate texture to the dough, and an acidic sauce on the side to dip in. 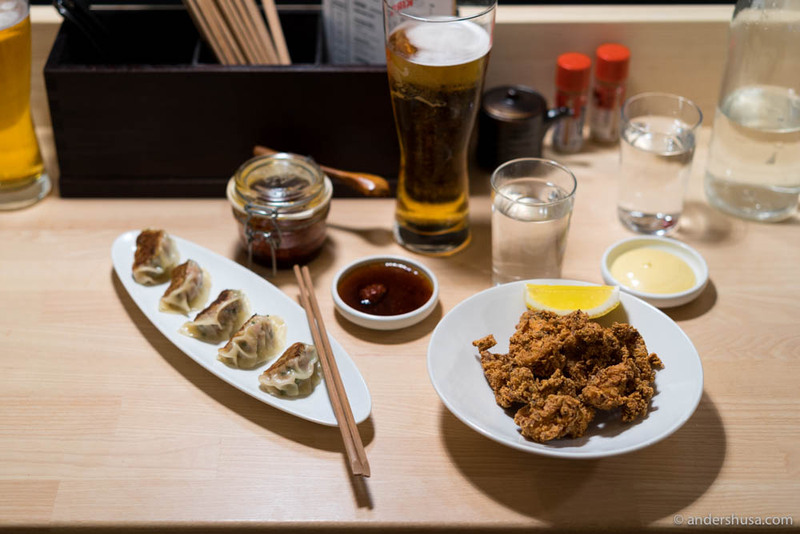 Koie Ramen is one of only three places in Oslo, that I know of, who makes chicken Karaage. Pjoltergeist and Bass are the other two. (Do you know anymore? Please, let me know in a comment below.) This version was the most crispy of them all, with the chicken still juicy inside. Squeeze some lemon juice over and cover each piece in that delicious mayonnaise. I suspect it might have been the classic Japanese Kewpie mayo, or an attempt to replicate that, which is sweeter than the European version. Anyway, the Karaage is crunchy, salty, fatty, sweet, and everything good at once. Sara had the Miso ( with a base of fermented bean paste) ramen which turned out to be a vegetarian option with mushrooms, Hedda ordered the classic Shoyu (soy-based) with pork neck, and I chose the Tonkotsu (pork bone broth) that comes with fatty pork belly. The only ramen we didn’t try was the Shio (salt-based). I was warned in advance by a friend about the Tonkotsu broth being too fatty, but I had to try it anyway. First and foremost, I thought the flavor was good. I agree that it was indeed very rich, but that could easily have been balanced with some more acidic vegetables or other elements inside. Unfortunately, the pork belly had been charred just a bit too much, which also left a somewhat unpleasant aftertaste of charcoal (instead of a softer, caramelized flavor from a Maillard reaction). And since I am nitpicking, the meat slices were also a bit on the thick side. I find it more elegant, and certainly easier to eat with sticks, when the meat is cut finer. As the rules of ramen go, the noodles in the Tonkotsu were thinner than in the other broths, to make the oily soup stick better. Hedda’s bowl of Shoyu ramen had a salty, lighter, and more clear broth. Her noodles were thicker, and more to my personal liking. However, the Miso ramen turned out to be my favorite of all three. It was creamy, but not too fatty, with a nice spiciness to it, and also with the thicker noodles. Delicious mushrooms made me forget all about the meat that was left out. All three bowls were topped with a marinated egg, slices of scallion, corn (except in the Shoyu), and menma (fermented bamboo shoots). Koie Ramen is a new favorite in town, that I fear I will return to just a bit too often. Restaurateur Ann Sung-an Lee (Mission Taco, Gressholmen Kro) together with the head chef Tim Homer are the people behind Koie Ramen. The word Koie means “Come home” in Japanese. A clear signal that they aim to make it authentic. – When we met, we realized we had the same vision. We both wanted a place that nods to traditional Japanese ramen, Ann tells me. They make their own noodles using a Yamato noodle machine. Mr. Kaoru Fuji, the President of Yamato and a trainer of legendary ramen chef Ivan Orkin in New York, has even been to Oslo to approve of the quality. Next time, I’m gonna ask to see the noodle machine! 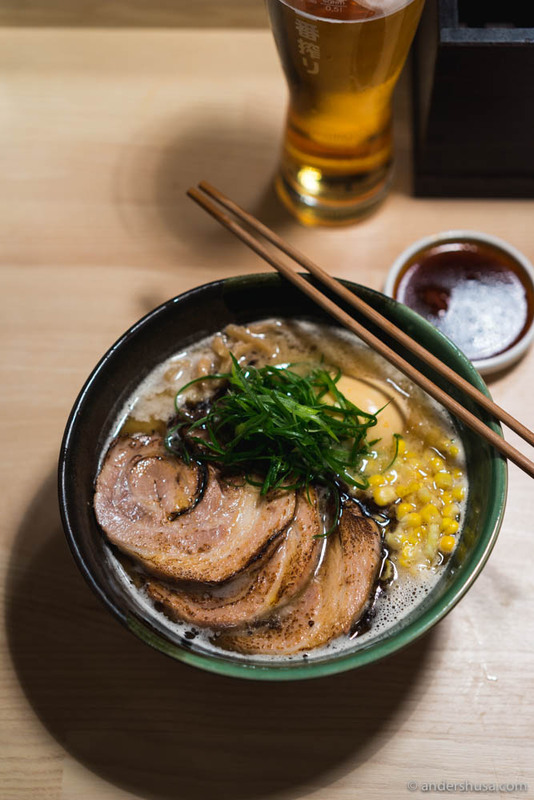 Want to learn more about ramen? Check out the Serious Eats Guide to Ramen Styles. How did you like Koie Ramen? Please leave your comment below. we really appreciate for your time spent. Always happy to guide you through the food scene of Oslo!